A Tiramisu recipe with a difference! 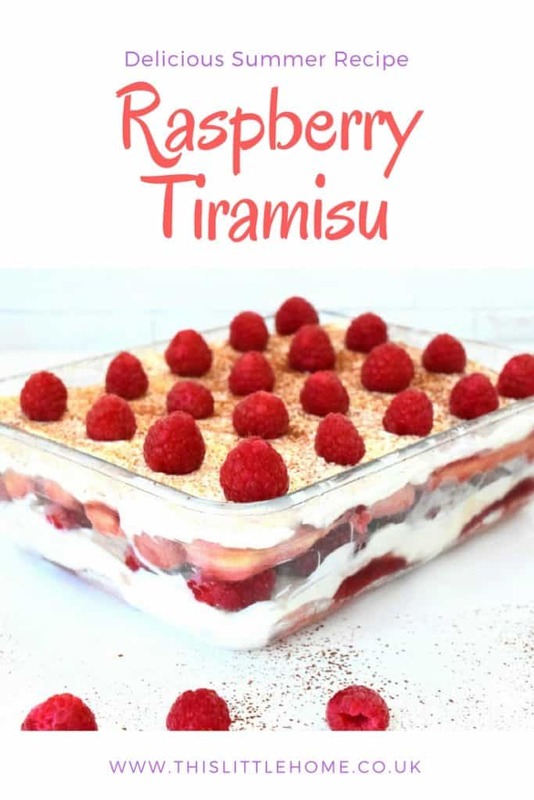 You’ll love the fresh, creamy taste of this yummy Raspberry Tiramisu. Since my love for coffee grew as I got older (and more in need of a daily caffeine pick me up!) I fell in love with tiramisu in all it’s creamy delightfulness! Yes, I know, this raspberry version doesn’t contain a hint of coffee like the more traditional variety. The boys aren’t keen on the coffee flavour just yet, so I couldn’t really justify making a traditional tiramisu and diving into it all by myself. Well, I could, but I don’t think I would be able to go near the scales for the next century for fear of having consumed about a gazillion calories! 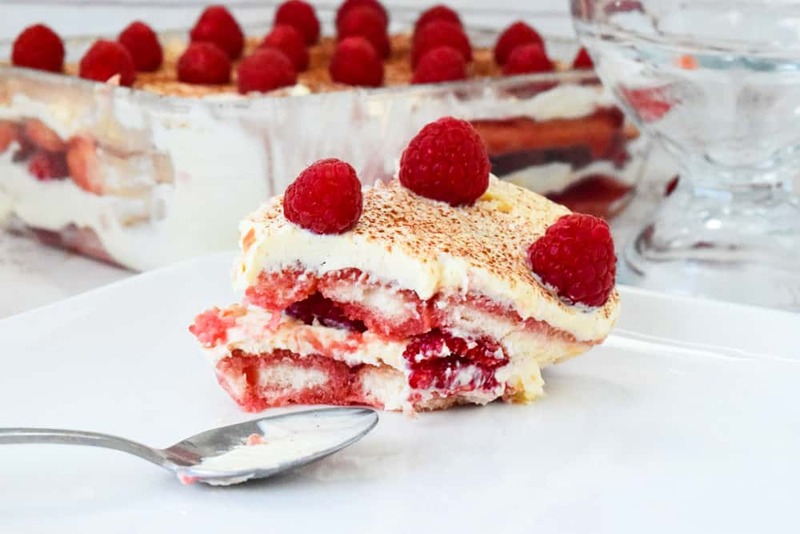 So, I created a raspberry tiramisu instead. 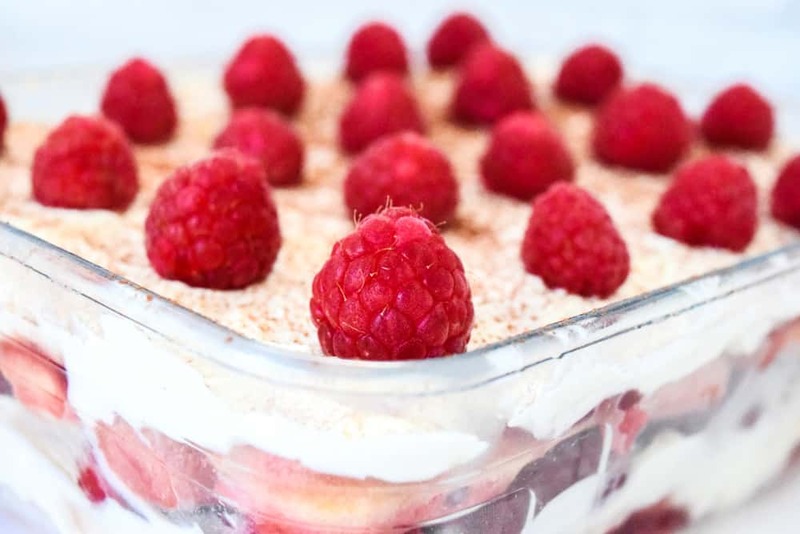 I know the boys love trifle and this comes pretty close in flavour and texture to that. Great tiramisu recipe, whatever the season! The great thing is, since raspberries aren’t currently in season, this will taste just as amazing with frozen ones. A little more squidgy and messy perhaps, but still tasty. Just close your eyes, enjoy, imagine the sun has come out of hiding and summer has arrived! Indulgent dessert recipes like this are great for parties and entertaining. You’ll be guaranteed to impress when you bring this out and serve with a cool glass of wine. I like to really soak the sponge fingers, the raspberry flavour should be soaked right through to the middle, so leave them in the raspberry sauce until they become pretty soggy, just handle with care so you don’t just create a spongy mess! If you don’t want the alcohol, just leave it out. It’ll still be amazing! Looking for more Strawberry Dessert Recipes? Are you looking for more dessert recipes? Head on over and try this strawberry pavlova recipe now! Place 150g of the fresh raspberries, 20g of the caster sugar, rum and orange juice into a pan and gently heat until the raspberries break down and the liquid thickens slightly. Remove from the heat and strain the sauce through a sieve to remove the seeds. In a separate pan, heat the egg yolks and the rest of the sugar and whisk until the sugar dissolves. Remove from the heat and whisk until cool, thick and creamy. Add the egg yolk to the cream and fold until combined. Place a layer of sponge fingers in your dish, making sure they are covered in the raspberry sauce. Top the sponge with a layer of the cream. 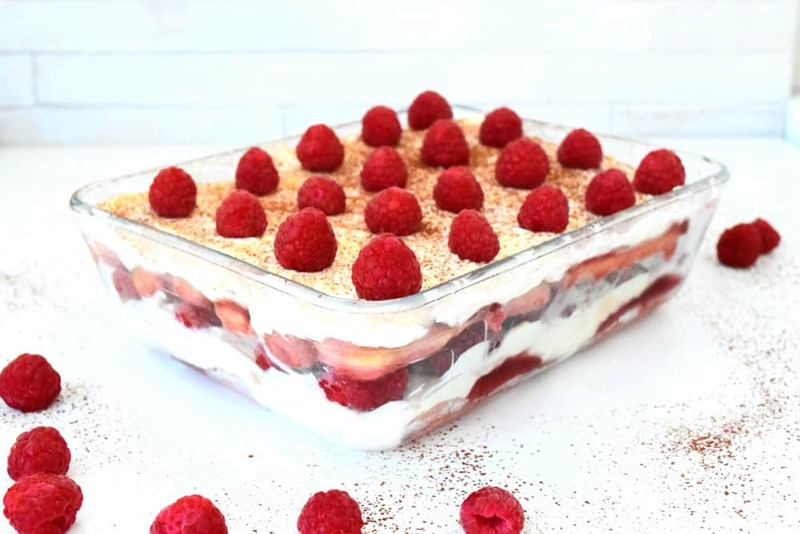 Top the cream with a layer of fresh raspberries and repeats the process again with another layer of each. Finish with a layer of cream and place in the fridge to chill for at least 3 hours. Once you are ready to serve, dust with the cocoa powder and top with the rest of the raspberries.